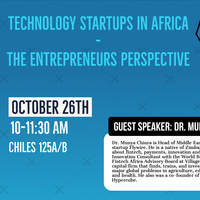 Learn about technology startups in Africa and engage with guest speaker Munya Chiura. Munya Chiura is head of Middle East and Africa payments for fintech startup Flywire. He is a native of Zimbabwe and is extremely passionate about fintech, payments, innovation, and tech in Africa. Munya is also an innovation consultant with the World Bank in Zimbabwe and sits on the Fintech Africa Advisory Board at Village Capital, a venture capital firm that finds, trains, and invests in early-stage ventures solving major global problems in agriculture, education, energy, financial inclusion, and health. Munya was a cofounder of Zimbabwe's first technology hub, Hypercube, which closed in 2015.